Whether your washer will not spin, or your dishwasher will not completely drain, or your dryer is not heating, there is no appliance repair problem too difficult for Oakes Appliance to address. Call us at (803) 324-5035 to schedule your appointment today! 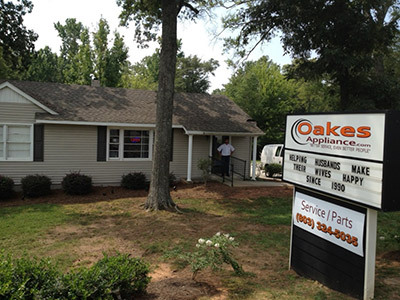 Steele Creek Appliance Repair is delivered by Oakes Appliance to your door, every day but Sunday. Our technicians can be at your home the same day, if you call by 12 noon. We are available Monday through Friday 7:30-5 and Saturdays 9-1 for emergencies. If you are busy like most parents, we offer Call- To- Meet appointments for your convenience. We go out of our way to offer honest, reasonable, and reliable repairs all while considering the needs of” You” (our customer). Oakes Appliance has been in business for over 24 years servicing appliances and keeping them in good running order. We will diagnose the problem with your appliance and give you the information needed to repair or if it is not reasonable to repair we will tell you and let you make the choice. We know your time is valuable, that is why we will try to repair your appliance on the first visit. Our technicians carry a large inventory of parts, and best of all, we guarantee all repair work with outstanding customer service. Our goal is to meet and then exceed your expectations. We charge a one- time service fee to come to your home and diagnose the problem with your appliance. Our Certified technician will explain the reason for the needed repair, and provide you with written estimate. The estimate will include the service fee. If you choose not to repair, you simply pay the service fee. We consider several things in determining if your appliance is worth repairing. The Physical Condition – free of rust and corrosion, decent physical shape. Mechanical Condition – Is machine running smoothly without leaks, noises, odors, etc. Will the cost of the repair extend the life of the appliance 2-4 years? Whirlpool, Maytag, Kitchen Aid, Jenn-Air, G.E., Hotpoint, Admiral, Amana, Frigidaire, Bosh, Kenmore, Tappan, Electrolux, Estate, Gibson, White-Westinghouse, Crosley, Broan, LG, Norge, Speed Queen, RCA, Kelvinator, Roper, Sears, Magic Chef, Hardwick, Brown, Modern Maid, And More.. Please call us if you live in Steele Creek NC for your Appliance Repair, Appliance Parts, Refrigeration. Appliance Parts We Do Not Stock, We Can Have The Next Day In Most Cases. Ask your neighbor about our quality services since 1990?